During the 1950s and 1960s, interior textiles designed by Maija Isola (19272001) caused a revolution in Finnish homes. Today her designs are more widely known than ever before, both in Finland and abroad. The beloved Poppy pattern from the 1960s, for example, has found its way into a wide range of new uses and contexts. 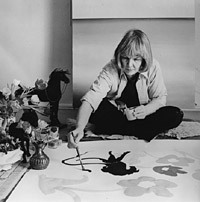 Less known, however, is the designer behind the patterns and her role as a visual artist. Teeming with colour, the extensive exhibition at Design Museum tells of the eventful life of Maija Isola and her work as a painter and the designer of hundreds of unforgettable textile prints. The exhibition will be accompanied by a comprehensive and richly illustrated catalogue, in which Maija Isolas lifes work is analysed from various perspectives. The contributors include Maija Isolas daughter, the artist Kristina Isola; Mika Pantzar, Ph.D., Head of Research (National Consumer Research Centre); Kimmo Sarje, Ph.D., visual artist; and Marianne Aav, Director of Design Museum. In celebration of the exhibition, Marimekko has complemented its selection of the currently available designs by Maija Isola with a new multifaceted fabric collection which features prints in different styles from four decades. The new fabrics will be in shops in May. In the summer, Maija Isola's prints will also appear on clothes designed by Samu-Jussi Koski, Jaana Parkkila and Mika Piirainen. The exhibition will be open Tuesdays from 11am to 8pm, WednesdaysSundays from 11am to 6pm (closed Mondays).